Patience may be a virtue, but it is increasingly harder to find among U.S. consumers. In our hyper-connected culture, where our expectation is to purchase products or services on-demand, businesses that fail to adapt are at risk. This study is the first of its kind to measure the patience (or lack thereof), chattiness and fast-talking of Americans in all 50 states. Marchex Call DNA technology measured hold times, rate of speech and frequency of speech from a data set of more than four million phone calls placed by consumers to businesses across a wide variety of industries from 2013-2015. Ranking the Nation’s 50 states on gabbiness, impatience and fast-talking. If you’re at a party with 50 guests, one from each state, who is likely to talk the most? Who will be the most patient? Who will talk the fastest? WHO ARE THE “FAST TALKERS”? Americans are talking faster than ever – on average Americans speak between 110 & 150 words per minute. And recent studies show that we’re talking faster… as texts, tweets and technology causes many of us to speak more quickly to try to fit it all in. Who is leading the charge? A clear pattern emerges when viewing the data on a map of the United States. The slowest talkers – as measured by words per minute – come primarily from the South. 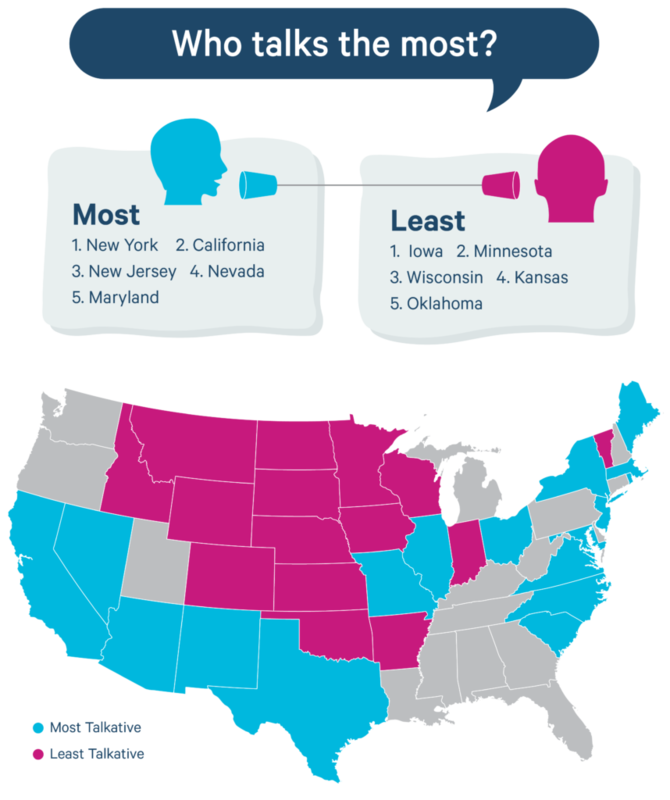 The fastest talking population comes from Oregon, and is followed closely by its neighbors in the Pacific Northwest, most of New England, the upper Midwest (states surrounding Minnesota and Iowa) and Florida. You may notice that citizens of New York don’t talk the fastest… but they do talk the most… see next section for more details. How much faster is a fast talker? For every 5 words a slow talking state utters, a fast talking state will utter 6. Just because you talk slow doesn’t mean you don’t talk a lot. Just ask the residents of South Carolina and North Carolina. 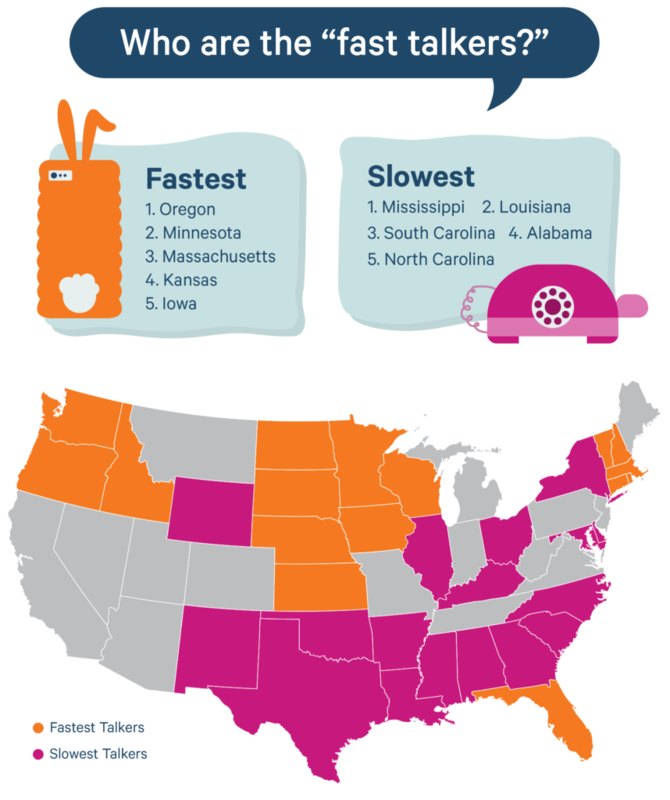 These states make the top 10 list of “slow talkers” yet they also make the top 10 list for “most words in a phone conversation”. Who else is on this list? The entire Eastern seaboard from Maine to South Carolina speak the most words in a phone conversation! The West and South from California to Texas also speak a lot on the phone, along with central states Illinois, Ohio and Missouri. If you want to have a conversation that is straight to the point, then focus in on residents from the middle. Most states in between Idaho to the West, Wisconsin to the East, Oklahoma to the South and all the way up to Canada use fewer words to get the point across than everyone on the coasts. How big is the difference? A New Yorker will use 62% more words than someone from Iowa to have the same conversation with a business, according to our data. WHO IS THE MOST IMPATIENT? No one likes to be put on hold, and it happens to us a lot. In fact, we predict Americans will waste more than 900 million hours waiting on hold in 2016, revealing an urgent need for businesses to improve their customer service over the phone. Below, we look at how tolerant residents from all 50 states can stand being put on hold. The states below in green are those that hang up the most when being put on hold. Once again, the Eastern seaboard dominates this category, but also the Upper Midwestern region of the United States is particularly nonplussed with being put on hold. The Southeast is fairly tolerant of being put on hold along with many other states in the middle of the country. Residents from Minnesota will hang up less than half as often as those from Ohio, North Carolina or New York. While this study uncovers America’s speech patterns, it also begs the question of how businesses can improve consumer experiences. After all, the “impatience index” is based upon how often we’re willing to wait on hold before hanging up in disgust! Studies from the Marchex Institute have shown that businesses can grow revenue and improve advertising efficiency by making changes such as (a) greeting a customer in a friendly manner and (b) reducing hold times. For more call handling tips, check out our post on why it pays to be polite. 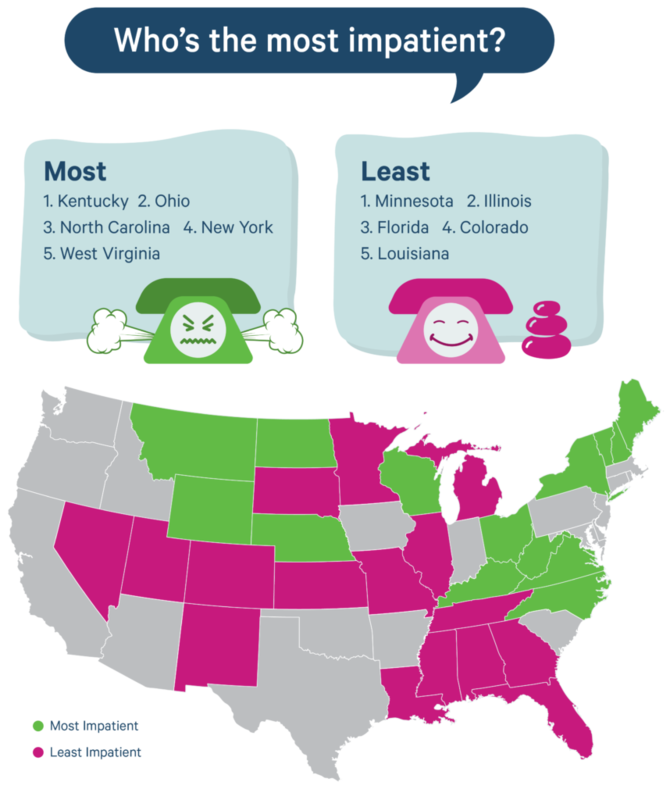 Correction: An earlier version stated states marked in pink contained callers who hang up the most when on hold, this has been changed to accurately reflect those states as being marked in green. The previous version of this story had the bottom 5 lists for all categories listed as 46-50. They now accurately reflect the correct ranking of 50-46. Retailers: Is your staff ready for moms, dads and grads? How are you using speech analytics?